Hollywood may have the red carpet covered, but a tiny village in France is rolling out a grassy version of the royal walkway. Marseille based artist, Gaelle Villedary has created an amazing feat with her public piece "Tapis Rouge" in Jaujac. In celebration of the town's 10th anniversary of art and nature trail programs, Villedary has mapped a winding green carpet throughout the entire village. A fun and fresh reminder of the provincial town's lush setting, this green trail is a path leading straight to nature. Situated in the south of France, Jaujac is a tiny commune, right on the bank of the Lignon river. While the city walls are rich with literary history and medieval architecture, they are tucked deeply within a rolling green landscape. Tourists from all over the world flock to the miniature city for the special historical art sites and nature trails throughout the luscious hills. 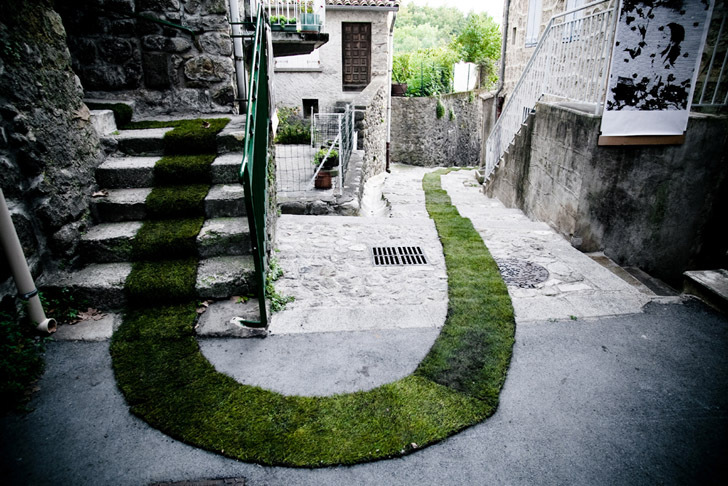 Public artist Gaelle Villedary helped Jaujac celebrate their programming success by creating a green path throughout the city streets. The carpet not only leads to the outer barriers of the town and into nature, but also lets each and every resident feel like green royalty with every step. For the massive project, Villedary used 168 rollers of turf grass, equalling 3.5 tons of material and spanning almost 1,500 feet! Climbing up and down steps and winding down long corridors, the green path brings nature inside the city walls, harmonizing the town with its surroundings. Raised on the Cote d’Azur and spending many years of her childhood in Africa, Villedary often enjoys involving nature in her artwork. Resilience is a major theme throughout her ouevre, with materials that often challenge existence and survival in various environments and circumstances. 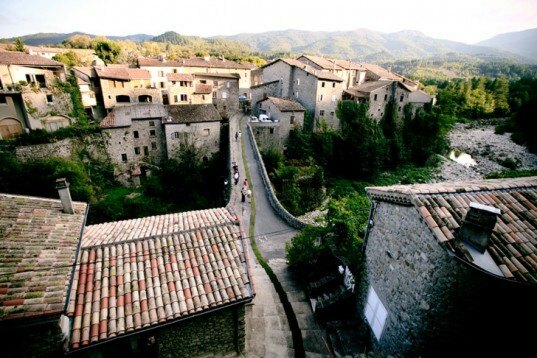 Situated in the south of France, Jaujac is a tiny commune, right on the bank of the Lignon river. While the city walls are rich with literary history and medieval architecture, they are tucked deeply within a rolling green landscape. Tourists from all over the world flock to the miniature city for the special art historical sites and nature trails throughout the luscious hills. Public artist Gaelle Villedary helped Jaujac celebrate their programming success by creating a green path throughout the city streets. The carpet not only leads to the outer barriers of the town and into nature, but also lets each and every resident feel like green royalty with every step! For the massive project, Villedary used 168 rollers of turf grass, equalling 3.5 tons of material and spanning almost 1,500 feet! Climbing up and down steps and winding down long corridors, the green path brings nature inside the city walls, harmonizing the town with its surroundings. Raised on the Cote d'Azur and spending many years of her childhood in Africa, Villedary often enjoys involving nature in her artwork. Resilience is a major theme throughout her ouevre, with materials that often challenge existence and survival in various environments and circumstances.